For 2013, the Infiniti M Sport package is now available on all-wheel-drive models. Newly standard features for all models include auto-dimming outside mirrors and a power soft-close trunk lid. Some optional features have also been shuffled as well. Automakers throw the word "sport" around as much as teenage girls use the word "like." After a certain point, your mind filters out those overused words and discards them as filler. It is refreshing when a word is used appropriately, and in the case of the 2013 Infiniti M, "sport" is certainly fitting. Among luxury sedans, the Infiniti M is a definite draw for drivers who enjoy a healthy dose of athleticism with their creature comforts. In terms of power and acceleration, the V6-powered M37 and V8-powered M56 will keep up with their German counterparts in a straight line. It's when the road begins to bend, however, that the Infiniti M pulls away. This level of road-holding prowess does come with a compromise in ride quality, as the M will transmit a few more road imperfections into the otherwise calm cabin. Stiffer ride notwithstanding, the Infiniti M lineup compares favorably with its more established rivals. The interior boasts top-notch materials and a long list of standard and optional electronic features, all of which are thoughtfully placed and expertly executed. Besides the conventionally powered models, there's also an M35h hybrid, which gets up to speed right with the M56, yet bests the M37 in terms of fuel economy. Its price premium isn't all that substantial either, making it the most appealing model here in our opinion. All things considered, we'd have no qualms pitting any of the Infiniti M models against their well-established German counterparts. Yes, the 2013 BMW 5 Series and 2013 Mercedes-Benz E-Class glide over roadways with more refinement, but we doubt anyone would ever consider the Infiniti uncivilized. Two other intriguing choices, the 2013 Audi A6 and Lexus GS 350, may represent an agreeable middle ground, too. In terms of providing real sport and real luxury, the 2013 Infiniti M stands as the real deal. Classified as a midsize luxury sedan, the 2013 Infiniti M is available in three trim levels that correspond to engine choices: M37, M35h and M56. Standard on the M37 are 18-inch alloy wheels, automatic bi-xenon headlights, foglights, power-folding heated and auto-dimming mirrors, automatic wipers, a sunroof, a power soft-closing trunk lid, keyless ignition/entry, dual-zone automatic climate control, leather upholstery, heated eight-way power front seats with power lumbar support, driver memory functions and a power tilt-and-telescoping steering column. Also standard are a rearview camera, Bluetooth and a six-speaker stereo with a CD player, auxiliary/USB/iPod inputs, an audio/visual jack and satellite radio. With the M35h you get all the standard features offered with the M37, along with a hybrid powertrain and unique instruments and display screens. The M56 adds rear parking sensors, a navigation system, real-time traffic and weather updates, voice recognition, heated and cooled front seats, a heated steering wheel and a Bose 10-speaker premium audio system with digital music storage. All of these additions are available on other trims as part of the optional Premium package. Most options are bundled in packages that add to the Premium package, and are not compatible with all other options. The Deluxe Touring package is offered on all trims and adds a power rear sunshade, an air purifier, upgraded leather upholstery and interior trim, and a 16-speaker Bose audio system. Also available is the Technology package, which adds adaptive cruise control, a lane departure warning and prevention system, a blind-spot warning system, a forward collision warning system, adaptive headlights and the "eco pedal" that provides feedback to the driver to encourage fuel-efficient driving. The M37 and M56 each offer a Sport package, although the content varies between trims. The M37 package includes 20-inch wheels, summer tires (all-season performance tires for AWD models), sport-tuned suspension and brakes, four-wheel active steering (rear-drive models only), sport seats and steering wheel, and unique exterior styling elements. Stand-alone options are few and include a rear deck lid spoiler and an aerodynamic body kit. 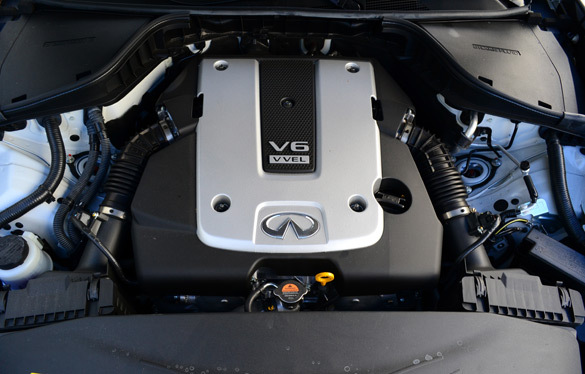 Powering the 2013 Infiniti M37 is a 3.7-liter V6 that produces 330 horsepower and 270 pound-feet of torque. As with all M models, a seven-speed automatic transmission with four different shift modes (Standard, Sport, Snow or Eco) is standard. Rear-wheel drive is also standard, with all-wheel drive available on M37 and M56 versions (designated by an "x" after the model names). The M56 receives a 5.6-liter V8 that produces 420 hp and 417 lb-ft of torque, while the M35h runs on a hybrid powertrain and offers a combined 360 hp from its gas-fueled 3.5-liter V6 and electric motor. In Edmunds performance testing, the M37 went from zero to 60 mph in 5.9 seconds, while both the M56 and M35h made the same sprint in a very impressive 5.2 seconds. With rear-wheel drive, the M37's EPA-estimated fuel economy is 18 mpg city/26 mpg highway and 21 mpg combined. The M37x drops slightly to 17/24/20 mpg. The M56 is rated at 16/24/19 mpg and the M56x turns in a comparable 16/23/18 mpg. Estimated mileage for the M35h is an impressive 27/32/29. Standard safety features for all 2013 Infiniti M models include antilock disc brakes, stability and traction control, front side airbags, side curtain airbags, active head restraints and a rearview camera. Included in the Technology package are a lane-departure warning and prevention system, blind-spot warning system and a forward collision warning system with intelligent brake assist. All three M models did very well in Edmunds 60-0 brake testing. The M37 stopped in 115 feet, the M35h in 119 feet and the M56 in 112 feet. In government crash testing, the M models earned an overall rating of five out of five stars, with four stars for overall frontal crash protection and five stars for overall side crash protection. The Insurance Institute for Highway Safety gave both the M37 and M56 the best possible of rating of "Good" in the frontal-offset, side-impact and roof strength tests. Infiniti has given the M top-notch cabin design and high-quality materials. As with the car's exterior styling, the cabin's powerful lines call to mind the muscular curves of a bodybuilder flexing on the stage. Opting for the Deluxe Touring package adds diamond-quilted leather seats with contrasting piping, unique "silver-powdered" wood trim, a faux-suede headliner and enhanced materials on most primary touch points. In total, the M's interior challenges those of its established European rivals for refinement. It also has the space and technology to compete with the Europeans as well. The cabin is quite roomy, offering generous space for occupants and a relatively tall greenhouse that provides good outward visibility. As for technology, it's hard to think of a rival that betters the M for all the available entertainment, comfort and safety technologies that can be had once you check all the options boxes. In particular, Infiniti's navigation and audio interfaces are some of the most user-friendly in the business. In terms of storage, the M has a 14.9-cubic-foot trunk; that drops to 11.3 cubic feet for the M35h. The 2013 Infiniti M is a big car, but drives smaller than you might think. Its steering effort weights up less abruptly than that of other Infiniti and Nissan sedans, and it exhibits a downright feline willingness to change direction. All three powertrains offer the sort of abundant power and acceleration that makes them fully competitive with the M's BMW and Mercedes rivals. Those wishing for an even more sharply tuned luxury sedan can select the Sport package with its various performance upgrades. The combination of a firmed-up sport suspension and 20-inch wheels, however, results in a stiffer ride that likely won't suit many buyers in the luxury segment.